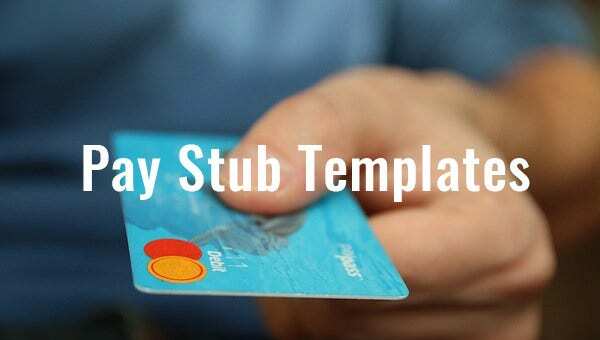 24+ Pay Stub Templates – Samples, Examples & Formats Download! Payroll management can be a very time consuming affair, and if you’ve had the pressure of getting through a month’s pay slip generations’ task, you’d know how difficult life can be without a good format. 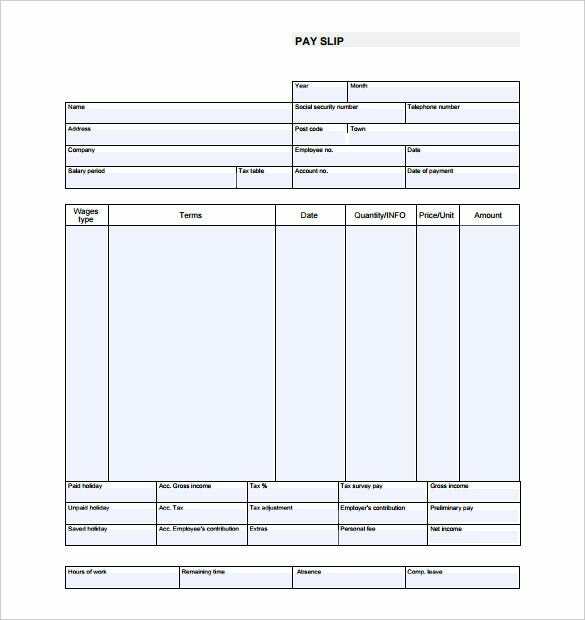 More importantly, you need a proper pay slip stub template that you can rely on in order to quickly generate pay slips for different employees. With some of the best pay check stub templates coming to you from the world of premium and free utility templates, you can put your mind at ease. A pay stub is actually known by a lot of different names, like pay check, or payslip, pay advice and even pay check stub. Undoubtedly, it is one of the most handy and efficient, not to mention important, pieces of document in the corporate world. Managing the payroll of your employees can be tricky, time consuming and extremely complicated. What can complicate it further is if you do not know how to proceed with a pay stub, which has a more or less fixed format that is accepted throughout the world. 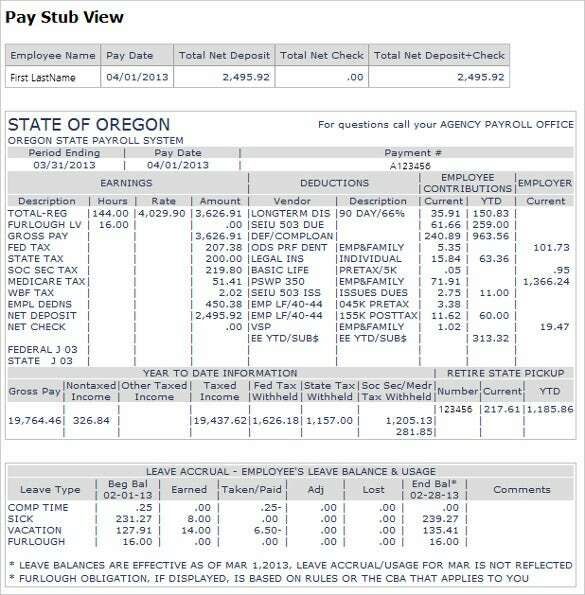 Having a pay stub template handy will allow you to perform your functions with ease, and in a shorter span of time. > How to Choose the Right Pay Stub Template? If you’ve been looking for a good, well designed check stub template, chances are, you’ve been disappointed; there are hundreds of different kinds of formats available and that can send your head spinning. 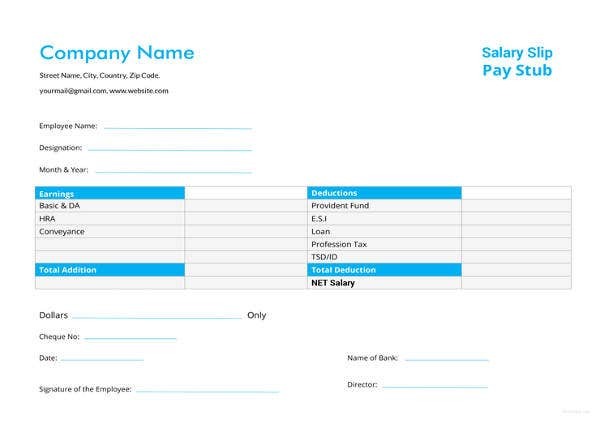 Your pay slip template needs to be neat, it cannot have information cluttered all over the page. While dealing with finances, you cannot afford to be clumsy. 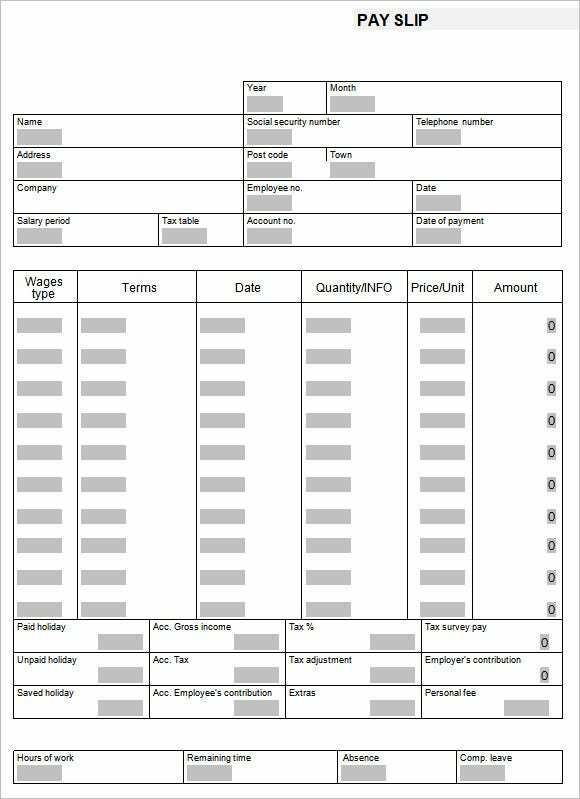 A good payroll check template will allow you to convey the information to your employee, such that any confusions can be avoided. However, how you want your pay stub to look is entirely up to you – do you want it in colour? Or do you want to stick with the conventional black and white pay cheques? After you’ve answered these questions, you can proceed to the next step, which is the actual selection. Gone are the days when an employee was actually paid for his services through a check. Now, most companies around the world prefer to pay their employees through electronic means, by using a wire transfer system. No physical cheque is used in this process, thus saving the company time and money. It also avoids risks of fraud. Now the term pay cheque is figurative, and is used to refer to a pay stub or a pay slip. Now it might so happen that one of your employees do not have a bank account. In that case, what you can do is transfer his or her pay to a special payroll card. It is actually a lot similar to a debit card. Once you do so, your employee will be able to access his or her salary through this payroll card. This card can even be used at automated teller machines for withdrawing cash. This is a modern take on the traditional concept of pay stub. It is in many ways convenient for both the company and the employee. A warrant of payment or a payroll warrant looks a lot like a cheque, which is why it is commonly called pay checks. But that is the unofficial term for it, since there is no question of a checking account in this case. You can even send / emai pay stub to your employees with this. If you’re looking for a good excel pay stub template which is easy to edit, you can try this one. It consists of all sorts of essential information, like employee ID, the name of the employees, the number of hours worked by them, vacation hours, sick hours and overtime hours. You can create a payroll calculator, which is efficient and useful, with the help of this free pay stub creator. 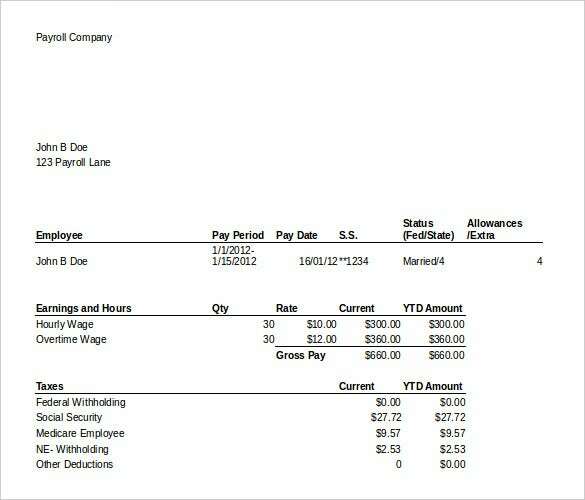 You can insert details like name of the employee, and his payment calculations, deductions, taxes etc on the pay stub. 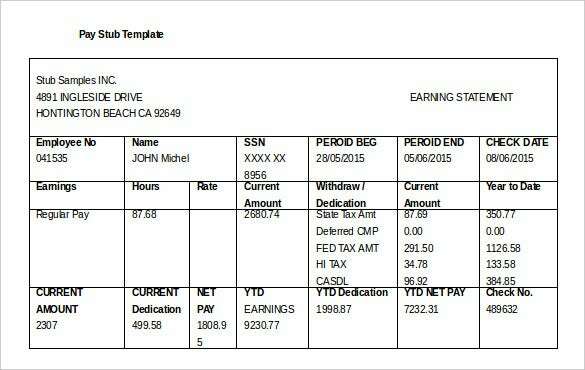 This organized and well designed pay stub sample is available in a PDF format, which you can download and edit as you please. There are separate columns for each, which allows you to arrange your information in a neat manner. 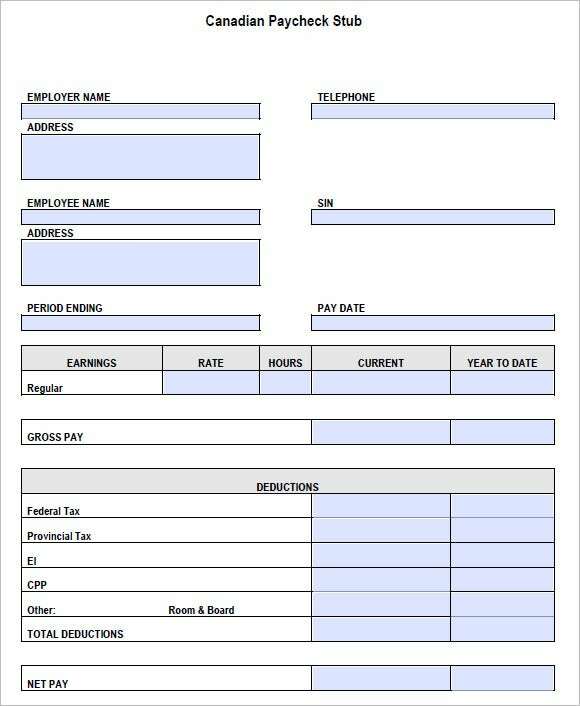 This is a payslip template that has fields for name, address, social security number and other details per employee in addition to the fields for tax details. 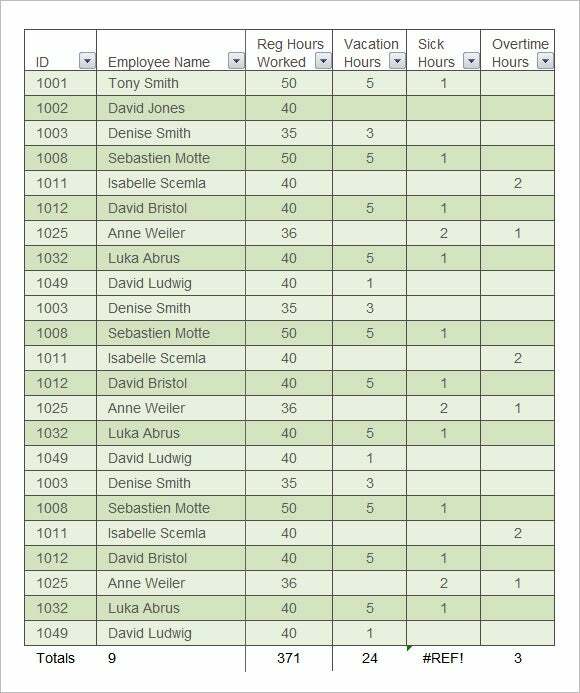 Keeping a track of payment for each employee has never been simpler and more organized. 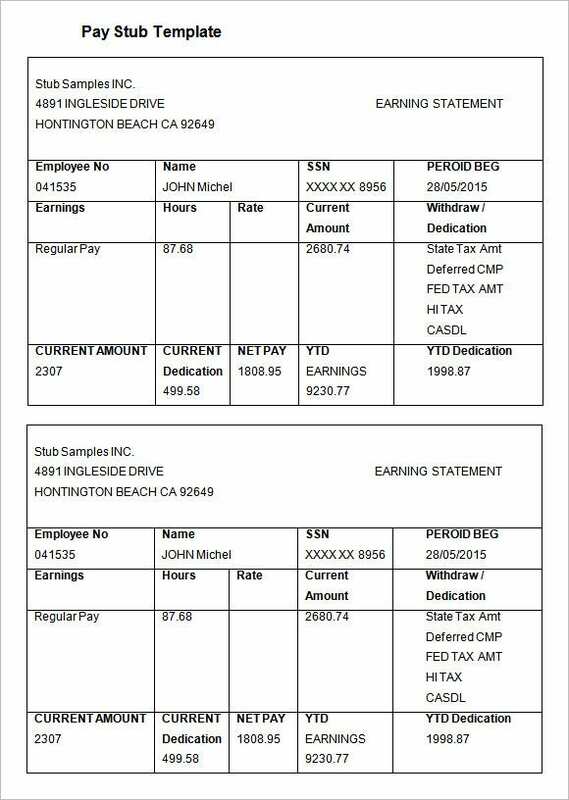 Get your very own customizable pay stub with space for your own logo and company details along with fields for employee information. Keep the account books up-to-date with the help of these printable forms. 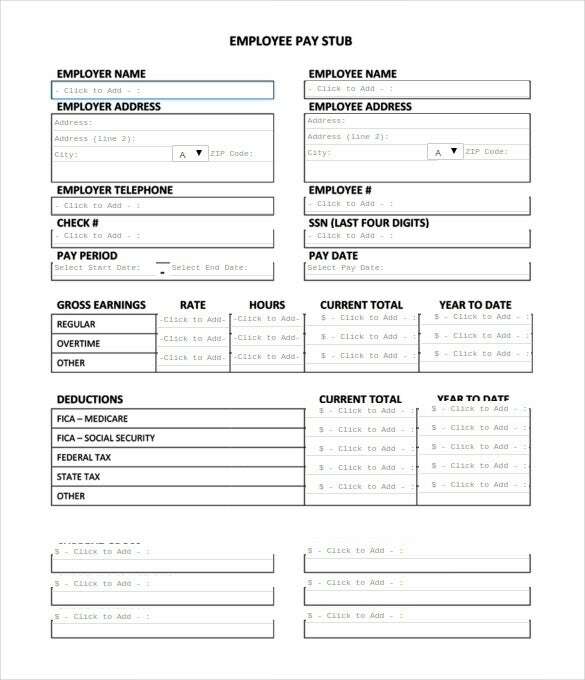 This free check stub template would be a great way to design your own pay stubs. The layout of the template makes it easy on the eyes, and thus easy to follow. You can include various kinds of information like taxable gross, deductions, total amount and final payment. Pay Slip is a standard form that is highly useful for the small companies during the issue of pay checks to employees. This has space for employee details, payments, rate, deduction, year to date salary and much more to make your task easy. This earning statement is easily downloadable, and once you do, you can easily customise it with your own details. You can add your gross wages on the left, and the deductions and net wages on the right to give it a neat clutter-free look. 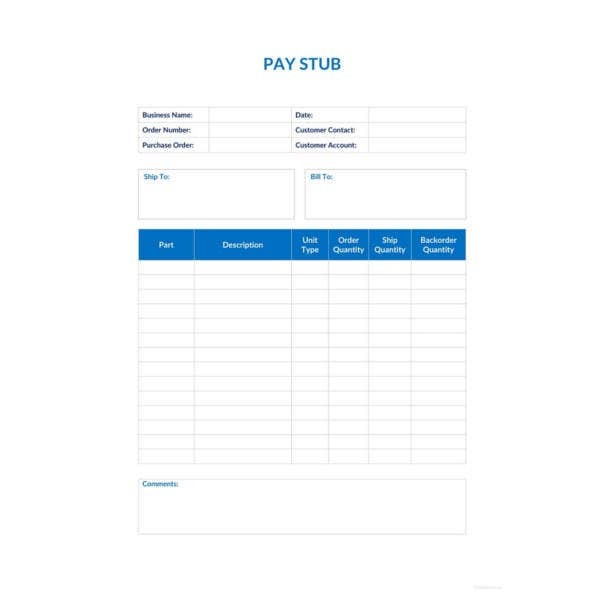 This pay stub template word can be downloaded and edited fairly easily, you can mention all payment related details in the spaces provided, so as to avoid confusions and queries later on. 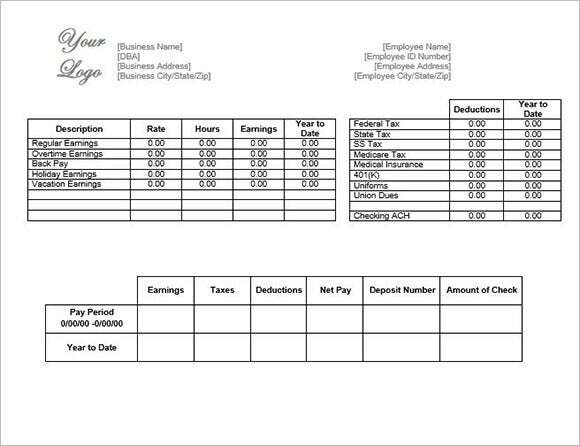 Use this printable template to make your payroll look professional and accurate. 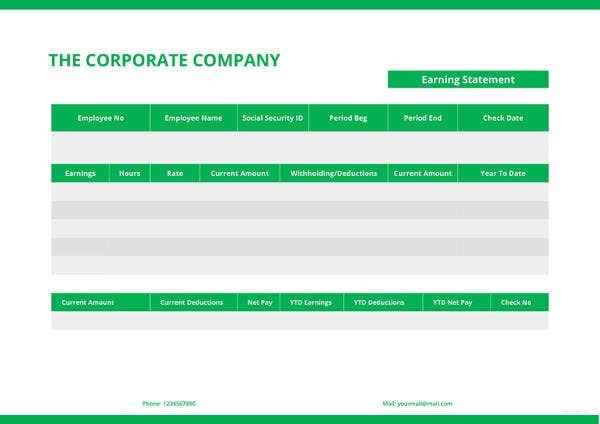 With largely predefined sections, this template helps to keep the payroll of any company especially small ones up to date with ease. 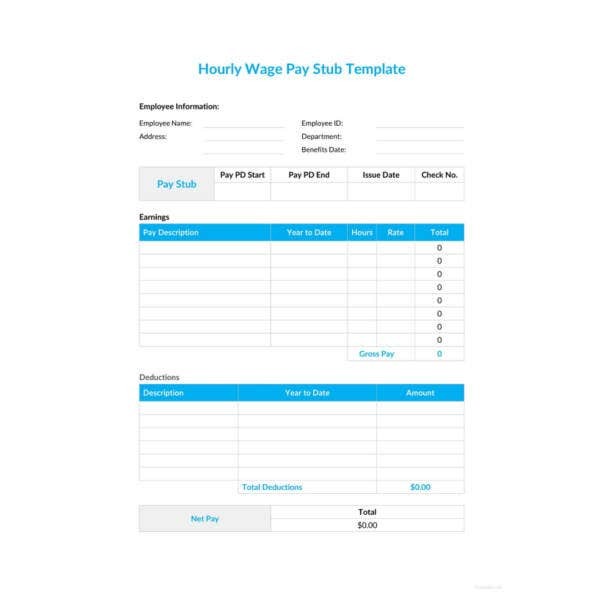 This free printable pay stub template is completely blank, allowing to fill in whatever details necessary. It would be the perfect example of a pay stub, and you can follow it to come up with your own as well. 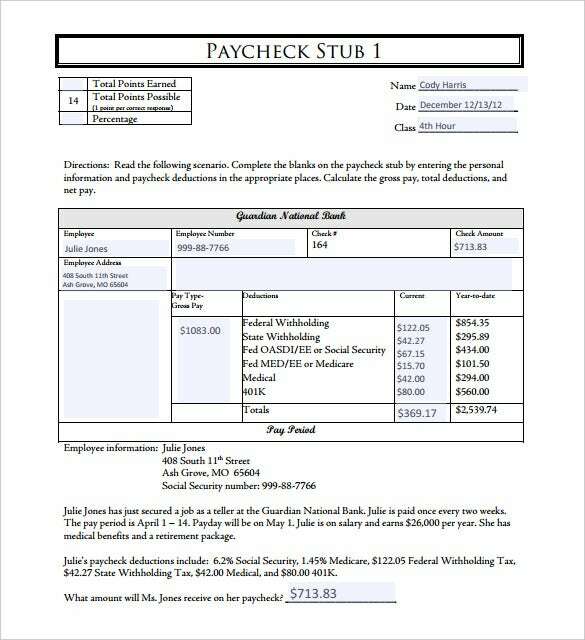 This free paycheck stub template contains all the essential information required in a pay stub, like the name of the company, the employee’s name, his personal details, his billable hours, his total earnings, tax deductions and finally the net payment to be made. 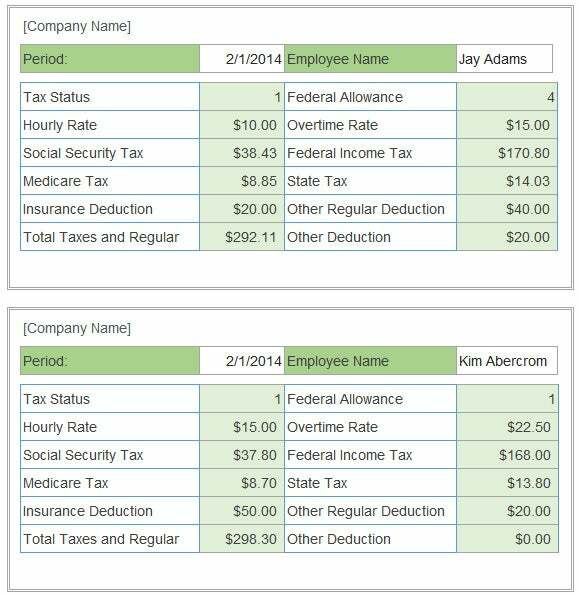 Calculate and record your employee payroll with this template. The three worksheets included are for employee wage and tax information, pay calculation on the basis of overtime and regular hours in addition to leaves and the final one to generate paystubs. 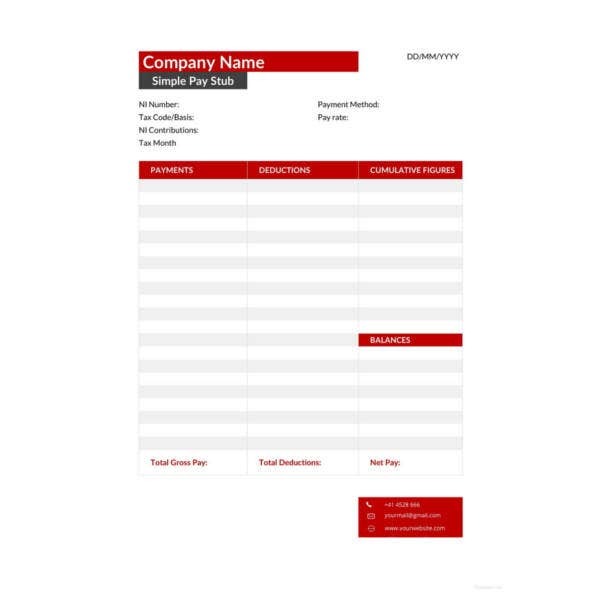 This blank pay stub template would help you calculate an employee’s net wages. You can write his total earnings, gross pay, deductions and taxable amount, and net pay at the end. It is a comprehensive pay stub, which can come in handy. These templates allow you to quickly key in the name and other details of the intended beneficiary, and updating of the pay to be given under different sections and sub heads. Also, some top notch blank stub check templates come with integrated calculation functions that can quickly provide accurately added amounts. Such templates make pay slips generation infinitely easier than any manual method, and that’s why such templates are right up there in the desire list of people from accounting and finance departments of companies. With advanced payroll management functionalities such as calculations of dues, arrears and outstanding, and ddetailed calculations based on details such as overtime hours, sick leaves, annual leaves, vacations, etc., you can entrust pay stub templates with the complete payslip creation responsibilities. 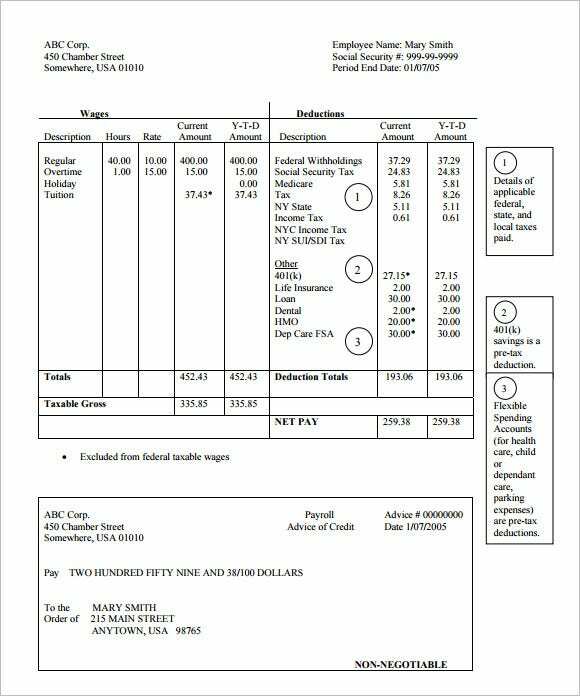 Advanced pay check stub templates also create charts, graphs and bar graphs to showcase information visually, integrate company logos, headers and footers, and also leave space for manual comments to come before or after printing. Printing payslips in different formats, paper sizes and orientations is also facilitated without any hassles with these pay stub templates at your disposal. > Why is a Pay Stub Important? If you’ve been reading the news lately, then you must have come across a couple of pay stub cases. Those are pretty common nowadays, each such legal case can settle for up a whopping amount of $8.25 million. Is that enough to convince you? Apart from being a proof of employment, it is also a proof of payment. 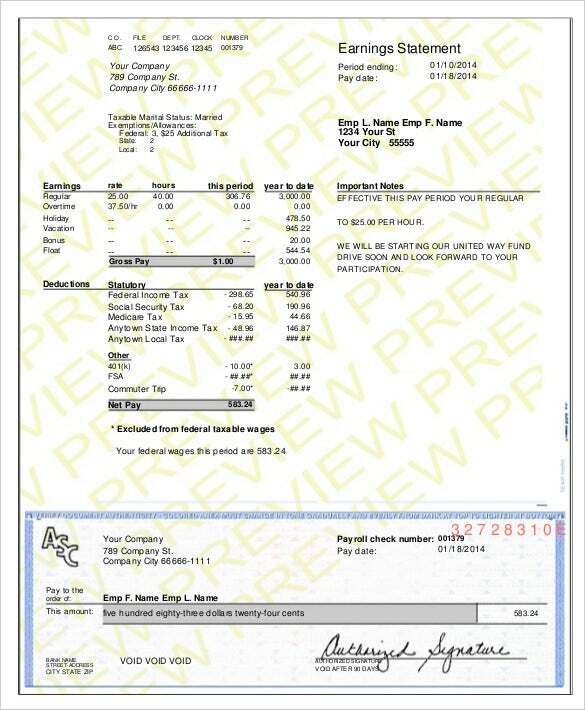 Even the large companies are not immune to frauds, if you are faced with one, this pay stub will be your weapon in the battle. A pay stub that is efficient will need to contain all essential details, starting with the basics like names of employer and employee to the nitty gritty of the matter. That will allow you to save this pay stub for future references. A payroll template needs to contain essential information like name of employer, employee’s social security number, the employee’s hourly rates, the total number of hours the employee has completed, the gross wages that the employee has earned, any kind of deduction and finally the net wages the employee is supposed to get. 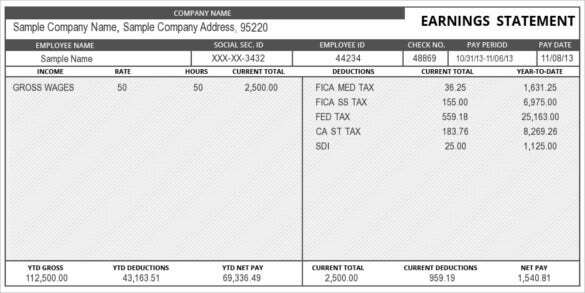 A payroll check template should be easy to edit, customizable, and ready to print. What is the point of a template if it just causes the user more hassle? You can try out the exclusive stub templates available online; these make your job easier with most of the details already provided. It will help you keep a track of employee records. •Check for security measures before you download pay stub templates. You need to make sure it is absolutely secure before going forward. Check and recheck if you have missed out any important information. Everything must be included in the pay stub. See that it saves your company time and money, and saves you the hassle of having to do it manually. Don’t be impulsive while selecting a pay stub for your company, taking time to decide now will only be helpful in the long run. At template.net, we know how important your pay stub is to you. 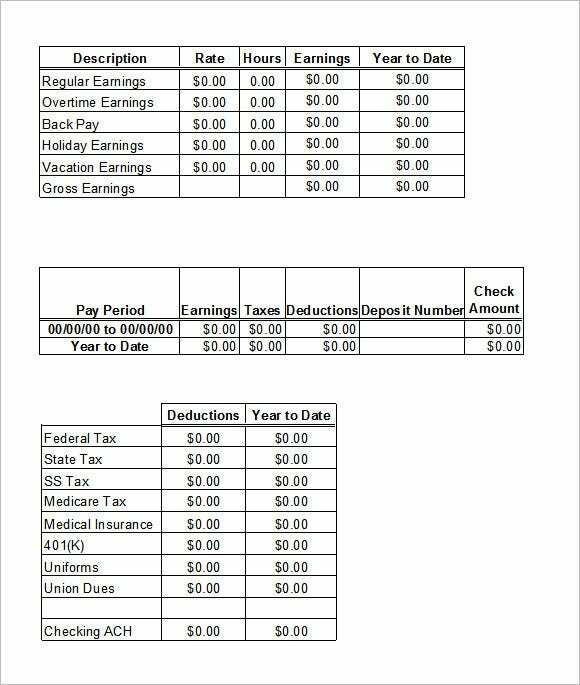 To save you trouble, we have come up with numerous helpful and handy free printable paycheck stubs that you can download. All you have to do is select the one that meets your requirements, and edit it with your employee’s details.